Ok, here it is. The beginnings of my four-year-old son Steven’s scarf. It’s blue. And red. For his favorite Island of Sodor friends, Thomas and James. I started it with brioche stitch early in the week, and was cooking along fine, until one day when we were waiting for a speech therapy appointment for Steven, and I was filling out a bunch of paperwork, and lo and behold, an bunch of stitches came off my needles. Now, I don’t know what it is about brioche stitch. But when I drop stitches in that pattern, no matter what I do, I can’t seem to pick them up properly to set them back on the needle. The yarn over part just always looks wrong to me, and I can always see the row that looks twisted and wonky afterward. So what did I do? I wound up frogging. And then I tried any number of other stitch patterns, but no matter what, I didn’t like how they looked. I like this color pattern, the way it looks with switching colors every two rows. Hey, at least I don’t have to weave in hundreds of ends!! None of the other color patterns I’ve tried so far gave me the same satisfaction. So, I’m back to doing the brioche. And praying I don’t drop any stitches. Yeah, right. If anybody out there knows about picking up dropped stitches in brioche and can share their wisdom, I’m all ears. Achoo! And goodnight. It’s definitely spring here. 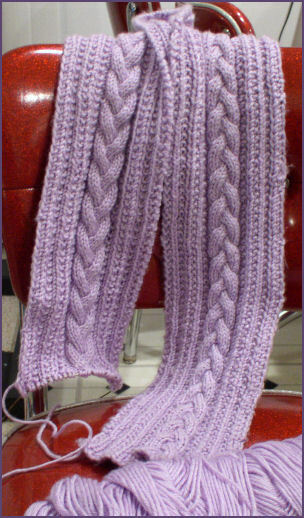 Finally, the long-suffering Fancy Cabled Braided Scarf is done!! It only took, what, 2 1/2 months? Ugh. I’ve said it before that I’m a painfully slow knitter. After all that I decided to give it to my stepmother Kathy, as she has admired my cable patterns before and I thought she could use a “hug” from me. We met today at the cemetery where my father is buried. It was cold and raining at the graveside so the scarf seemed appropriate there. Of course, the clouds parted as we were leaving, and the rest of the day was sunny and warm! This is my daughter Diana, trying her hand at striking a modeling pose. Isn’t she getting big? I think she was a bit sad at first that I gave this scarf away but she already has at least two that I’ve knitted her plus at least two more. So I think she’s pretty well scarfed, and I wanted to give something handmade to Kathy, since she has already crocheted afghans for me and for Diana. My next project is the Lace Edged Tee from Knitpicks, in the bright orange color of their Crayon yarn, at least officially. My four-year-old son saw today that I was finished with the cabled scarf and asked, “Are you going to make MY scarf now, Mommy?” Ok, so I may be side tracked for a bit. He wants it in two colors, “Blue for Thomas and Red for James” (which most moms of four year old boys will know what he’s talking about!) so I pulled two balls of Wool of the Andes from my stash today and now I’m trying to decide on a pattern. 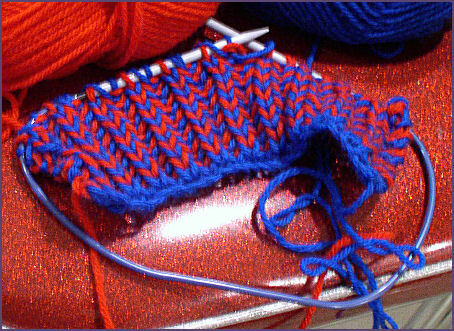 I think I will do something akin to Brioche stitch. We’ll see. 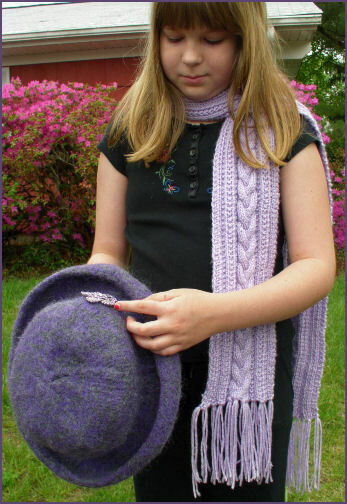 Big Girl Knits is Here! Finally, the book about ME!! Haha. Not really. But pretty darn close. One of the reasons that the idea of making garments scares the hell out of me is that I’m fat. And let’s face it. Most of the really cute sweater patterns out there aren’t made for fat chicks. At least not until now. 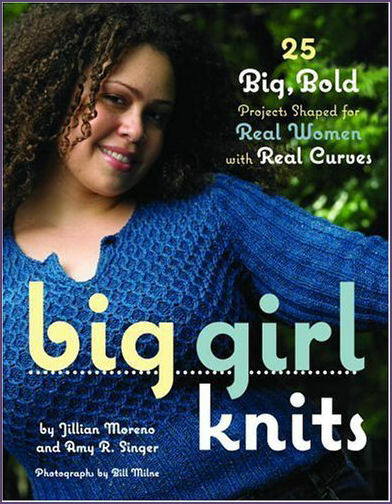 Big Girl Knits, by Jillian Moreno and Amy R. Signer, is more than just a book of really cool, hip patterns designed to make the best of our abundance; it’s also chock full of design tips that make real sense. Finally, a book that I can relate to. Some people are put off by the sort of “in-your-face” writing style. But not me. Sure, it’s a bit blunt, but heck, so am I. Perhaps that’s one reason why I warmed up to it. I loved reading the design tips and understanding where I’ve gone wrong with the vast majority of clothing choices already hanging in my closet. I wish more clothing designers would buy this book and take it to heart. Finally, a book that gives me the incentive to sit down and try a sweater. For real. Thanks, Amy and Jillian! Not Just My Grandma’s Clicky Bag! I’m still trying to figure out what all of the pockets, holders, and little loopy things are for. But my scarf project fits in with scads of room to spare, and I can see this bag comfortably holding all but the largest of projects. I can tell that there are tons of places to stash things such as my scissors, tape measure, darning needle, and other thingys that always get me digging through my knitting drawer. What fun. But my favorite part? The clicky, snappy top closure that reminds me of the purses that my grandmother carried when I was a preschooler. I used to love to just sit and click her purse. Ok, I’m weird that I even remember that, but hey… it didn’t take much to amuse me. 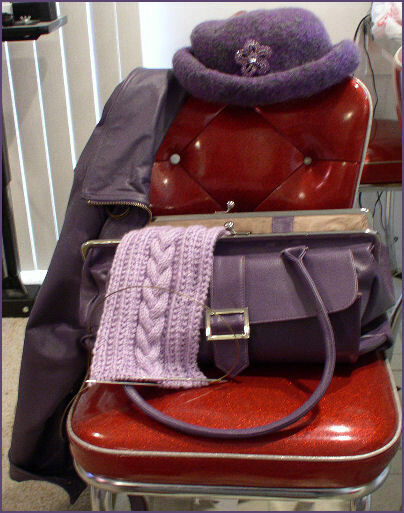 Thank you, Jordana, for making a bag that combines my loves of knitting, retro fashion, and purple… all at once! Ok, so I’ve been working on the same old, same old project for nearly two months. But I think I’m almost done and ready to go onto the next thing. I’ve enjoyed working on the project… it was my first design! Click here to see the pattern. But there comes a time when one wishes she could just move onto the next thing. Which is why my pile of UFOs is so large… boredom kicks in before finishing gets here. But I do have my sights set on my next project! It’s the Lace Edged Tee from Knitpicks. I already bought the yarn and pattern, despite my recently self imposed yarn diet… the pattern looks so interesting and the colors so vibrant. I chose to do mine in the orange color. The only thing is that the pattern only goes up to a size 47″, and sadly, I need to make mine just a wee bit bigger than that. So I guess I’ll be testing my guage math skills for the first time. Wow. Wish me luck! But first, I do have to finish that scarf!